As the day draws to a close, we’re reflecting on the initial welcome sessions. The day started with a speech from HRH Prince Feisal Al Hussein, and his words of encouragement for the days ahead. This was followed by staff presentations, as well as an introduction to our Lead Facilitator and Pioneer Facilitators. Icebreakers were next on the list, and it didn’t take long for our energetic Delegates to mingle with their fellow participants! The first day was a chance to explain Generations For Peace’s approach, vision, mission, values and our famous four (Drivers of Change): Innovation, Quality, Impact, and Sustainability. Furthermore, the Delegates were briefed on our curriculum, activities and programmes. 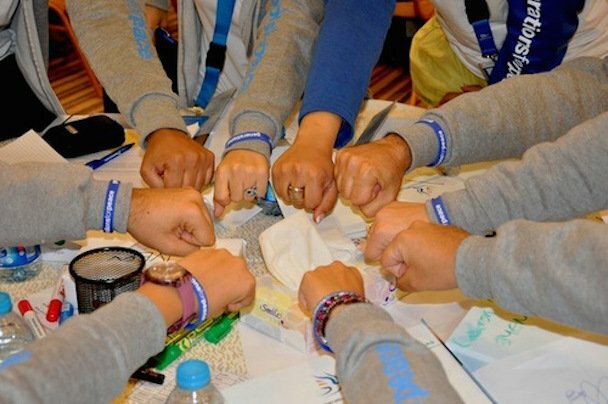 What are the core skills of a Generations For Peace Volunteer? This topic was met with great enthusiasm as Hana’ (Pioneer Facilitator) led the session on the many core skills our Volunteers need as they venture forth with their future programmes. Identity was another important topic of the day. Our Delegates were asked to put themselves in the shoes of someone from “the other side” (someone with whom they are in conflict) and imagine elements of that person’s identity and personality. The Delegates had to consider points relating to religion, family, political views and education, among others. This was followed by a broader discussion on the idea of community. Who is your community? Is it your neighbourhood? Is it your university? Our Lead Facilitator, Safiya, emphasised the importance of recognising your own community within a larger society. She did this in preparation for sessions on conflict tomorrow, where Delegates will be asked to identify conflicts within their communities. We’re looking forward to tomorrow’s sessions and great dialogue at #GFPCamp!